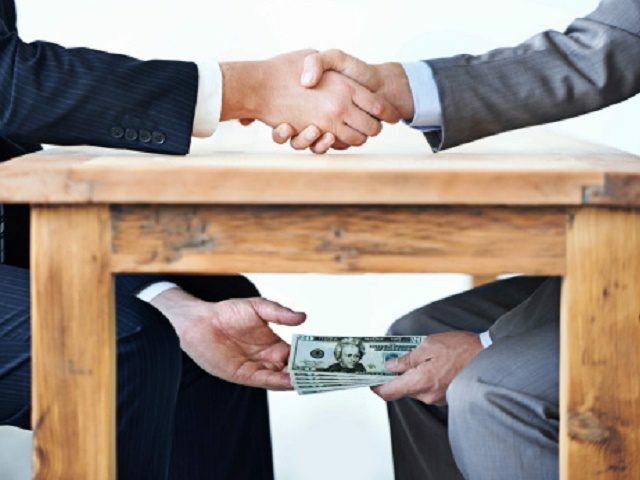 Extortion in Arkansas – Tax Increase Part 3 AND ACTION ITEM! More problems with the NABORS Landfill! A Federal Grand Jury Needs to be Called Forth! Since the FBI is already investigating the General Improvement Funds (GIF) here in Arkansas, they need to go a little further and investigate landfills and districts as well. (The mob loves trash and waste disposal fraud! They have multiple contracts in the North and many other states. Could they be operating here in Arkansas, too?) As always, follow the money! If this is the first time you are reading about this, you might want to go back and read Extortion Part One in Arkansas and Extortion Part Two in Arkansas. This problem affects the whole state, so people in other areas of the state need to read this article too. There was a Quarterly Inspection Conducted by ADEQ on December 20, 2017 of Ozark Mountain Solid Waste District (permitted as Northwest Arkansas Solid Waste Management District). The owner or operator of a waste tire processing facility shall record and maintain information regarding their activities. The records shall be available for inspection by Department personnel during normal business hours. No records on-site for review- Facility has not operated since 2010. The operator of the site shall prepare and keep at the site an emergency preparedness manual. The manual shall be updated at least once a year, upon changes in operations at the site. No emergency preparedness manual was available for review on-site. The owner or operator shall submit, for review and approval, an emergency preparedness plan that adequately mitigates all fire hazards, and provides for the safety and health of all persons who may be potentially affected by a fire event at the facility. Communication equipment shall be maintained at all facilities to ensure that the site operator can contact local fire protection authorities in the event of a fire. Adequate equipment to aid in the control of fires must be provided and maintained at the facility at all times. No communication equipment or fire control equipment was observed on-site at the time of this inspection. Waste tire processing facilities shall obtain a permit and shall meet the requirements contained in this regulation for waste tire processing facilities (Waste Tire Processing Facility Requirements) or shall meet the general permit requirements contained in this regulation. Owners and operators of waste tire processing facilities shall submit to the Department an annual report by March 1 that summarizes information on facility activities. The report shall be submitted to the Department on FormTP5 (Waste Tire Processing Facility Annual Report). There has been no Annual Report submitted since 2009. The waste tire site shall be kept free of grass, underbrush, and other potentially flammable vegetation at all times. Vector Control: An approved vector control program must be operational at all times for tires stored outdoors. The owner or operator shall develop and implement a program to control mosquitoes and rodents or request such control measures from the local mosquito and vector control office, so as to protect the public health and welfare. Mosquito control measures may include covering containers and trailers used for the collection and storage of waste tires with a tarp or placing them under some type of constructed cover during inclement weather and/or when the business is closed. The Permittee has taken no action to control vectors. Effective surface water controls run-on/run-off controls, such as berms and ditches, shall be established for all waste tire storage and processing areas to prevent surface water from entering the storage and/or processing area and to prevent liquid runoff from a potential tire fire from leaving the site or entering surrounding water bodies. The storage limit for processing facilities is thirty (30) times the daily capacity of the processing equipment used. The facility currently has no processing equipment in operation. A fifty foot wide fire lane shall be placed around the perimeter of each waste tire pile. Access to the fire lane for emergency vehicles must be unobstructed at all times. NABORS Landfill (CLASS 1 HAZARDOUS WASTE) in Baxter County, Arkansas originally served six (6) counties, but by 2012, only Baxter and Marion counties continued to use the landfill, and the Ozark Mountain Solid Waste District’s board of directors decided to halt landfill operations. As of May 18, 2017, the Ozark Mountain Solid Waste District was still taking Electronic Wastefor free. If the troublesome NABORS Landfill stopped receiving waste November 2012, then why were they still accepting Electronic Waste as late as May 2017? Is this practice still going on, and who is benefiting from this? And why are people in ALL SIX of those counties supposedly on the overtaxing hook for an unconstitutional amount of $15 to $20 Million, paying for the two counties who were using the landfill before it closed? (Closure could take up to 30 years!) This is ridiculous! So, what is being done about this fiasco? A resolution was drafted to express disapproval regarding the “service fee” (trash tax) and was passed in Boone County recently. Newton County tabled theirs. We are including an UPDATED resolution for each of the affected 6 counties (Baxter, Boone, Carroll, Marion, Newton, and Searcy) in our article below (keep reading). The Newton County “RESOLUTION EXPRESSING DISAPPROVAL CONCERNING THE SOLID WASTE ASSESSMENT ON NEWTON COUNTY PROPERTY OWNERS” did not pass as originally reported. 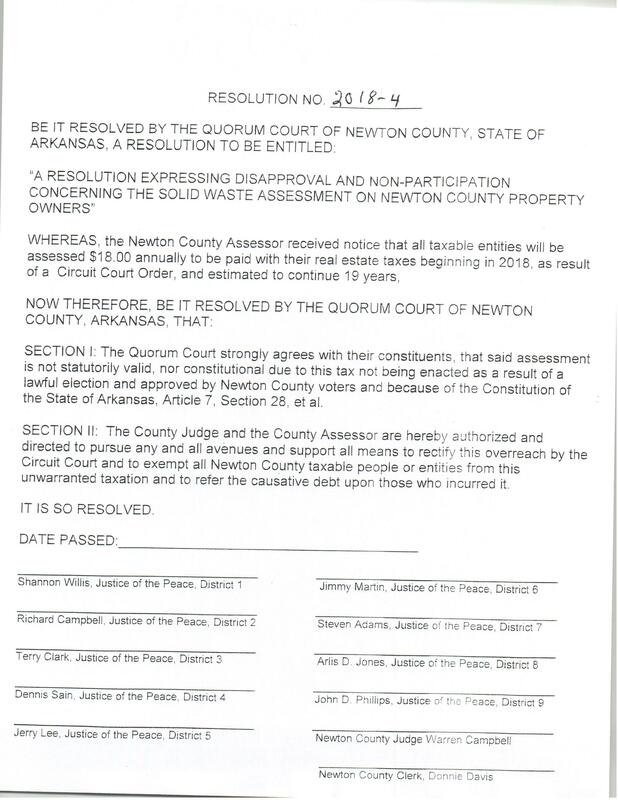 This resolution was put on hold and tabled after the devious Prosecuting Attorney David Ethredge told the Newton County Quorum Court that they could end up in litigation for going against Circuit Court Judge Tim Fox’s court ruling that added the $18 fee to most real estate property tax bills in six county area of the Ozark Mountain Solid Waste District. (Keep in mind, Secure Arkansas believes that Judge Fox’s ruling was ILLEGAL in the first place, not to mention unstatutory and just plain WRONG!) This resolution will be brought up again at the next Newton County Quorum Court meeting (the first Monday of each month at the Newton County Courthouse). Circuit Court Tim Fox’s court ruling which caused the extra $18 “service fee” to be added to most real estate parcels of the six counties in the Ozark Mountain Solid Waste District for the next 18+ years (our guess is 30 years) was to pay off the bondholders’ bad investment. This unstatutory ruling is making excessive demands on Arkansans’ ability to pay for the illegal activity that occurs in and around Class 1 landfills, and we suspect this occurs wherever there’s a Class 1 landfill distinction, NOT JUST THE NABORS LANDFILL! You need to ask the question: why is Prosecuting Attorney Ethredge trying to protect Circuit Judge Tim Fox and the bondholders instead of the property owners? for which the board makes solid waste collection or disposal services available. d) The board may levy a service fee on each residence or business for which the board makes solid waste collection or disposal services available. Click here to see the Newton County Resolution that was tabled this week. It’s also in the body of this alert directly below. CALL YOUR JUSTICE OF THE PEACE (JP) IMMEDIATELY! Ask them to sponsor the resolution! Reminder, the JPs are the ones that present legislation and vote on it, NOT the County Judge. He presides over the quorum court without a vote, but with the power of veto (ACA 1-4-14-1101-1102) , unless there is a tie. JPs, you are the ones who would sponsor this resolution. Contact information for Newton, Searcy, Carroll, Marion, Baxter, Boone County JPs is shown below. Attention! Be sure to save these JP contacts for future reference — the phone numbers are hard to get! Now, what else has been happening? Secure Arkansas immediately sent out an FOIA request on March 6th asking for the minutes of March 6th’s “covert” meeting. One thing that could have triggered this emergency meeting may have been the recent FOIA requests Secure Arkansas sent to ADEQ asking them to provide and make available for public enlightenment the documents listed below. So far, it appears that ADEQ and Ozark Mountain Solid Waste District are stalling! Secure Arkansas previously sent out some FOIA requests on February 28, 2018 and as of March 7th, we only received 2 out of 14 items that we requested. We need that Sunshine Law obeyed by ADEQ so that proper light can be shed on what we consider a government cover-up! The response from the above request was provided in four PDF files. Only two requests (2) were fulfilled so far. The Nabors Landfill did not utilize all of the fourteen (14) instruments listed below. These are templates that were developed by ADEQ for permitted facilities to choose from and demonstrate financial assurance. Municipality Resolution – This is supporting documentation for a Municipality Contract of Obligation. County Resolution – This is supporting documentation for a County Contract of Obligation. Perhaps this addresses some of your concerns. Notice in the reply from ADEQ – how many instruments (documents) were NEVER established! Why is this? Those were documents that NABORS Landfill SHOULD HAVE FILED, according to ADEQ’s OWN REGULATIONS! What’s going on here? What kind of cover-up is this? Looks like Berryville Mayor Tim McKinney is a big player/ questionable actor in the woeful polical arena, Agenda 21 practices, and this lousy landfill business! He’s been mayor for around 30 years now. Carroll County residents have complained about how difficult it is to deal with the local government there, including contentious County Judge Sam Barr. Regrettably, McKinney has been in office way too long, and the voters NEED to get him OUT! Mayor Tim McKinney of Berryville says his city received $61,000 in state grants after he dropped objections to other state grants to a private college in Springdale. Mayor Tim McKinney told the Northwest Arkansas Democrat-Gazette he objected in 2014 to $91,000 in state General Improvement Fund grants [GIF] to Ecclesia College. Those indicted included former State Senator Jon Woods and Ecclesia College President Oren Paris III for kickbacks allegedly paid to Woods for GIF grants through the suspicious Northwest Arkansas Economic Development District. Surprisingly, former Rep. Micah Neal helped obtain one grant to Ecclesia College and subsequently pled guilty in January. McKinney is on the Executive Committee of the Arkansas Municipal League. In 2015, McKinney stated that former Camden Mayor Chris Claybaker accepted the position of Director of Economic Development for the City of Berryville. Before Claybaker was mayor, he owned abstract and title insurance offices in Camden, Hampton, and Rison. Claybaker also serves as executive director of the Berryville Chamber of Commerce, and McKinney worked closely with Claybaker on the Executive Committee of the Arkansas Municipal League. Oh yes, there’s more, and we believe we’ve just scratched the surface here! 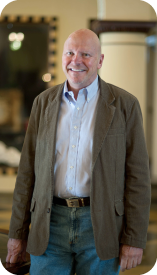 Timothy McKinney has been mayor of Berryville since 1991. 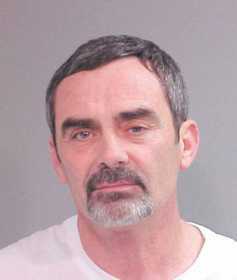 A police report says he was arrested Sunday and charged with DWI, possession of a controlled substance and speeding. Tim McKinney was arrested March 18, 2009 on Interstate 540 between Springdale and Fayetteville on marijuana and drunk-driving charges. Though he was found with less than a gram of marijuana, a second marijuana offense is a felony. McKinney’s lawyer, Beth Storey of Fayetteville, told Judge McBeth Tuesday that a plea agreement will be presented Friday in Washington County in which McKinney will plead guilty to that misdemeanor drunk-driving charge and enter drug court under Judge Mary Ann Gunn to deal with the marijuana offense. McKinney served one 39-day jail term in Carroll County for driving while intoxicated and marijuana possession, then served a 15-day term for a DWI in Washington County. Now we come to the another troublesome, murky player/actor in all this crummy mess! Ex-Mayor of Harrison, Jeff Crockett, whom we have addressed in past articles. Jeffery Crockett Real Estate Holdings in Boone and Carroll County. Looks like the Jeff Crockett Trust is worth millions and millions of dollars! Oh, this man! Hope he’s not trying to go into Carroll County and run for government! Be sure to read your Harrison Daily Times article: “Landfill fee upsets Newton County property owners” by Jeff Dezort for March 7, 2018. JASPER — Newton County property owners showed up at the Monday, March 5, quorum court meeting to ask why an $18 fee has been attached to their property taxes. They wanted to take down names of those responsible and called on the quorum court to take legal action on the grounds that the taxpayers didn’t vote for what they feel is an illegal tax. At an Ozark Mountain Solid Waste District board meeting Tuesday, district lawyer John Verkamp said he had been talking with the receiver put in charge of collecting money for bond holders who financed the purchase of NABORS landfill in 2005. Verkamp said the receiver wants to have four meetings on two separate days — one during the daytime, one at night — but he wasn’t sure where those meetings would be held. A woman in the audience asked that at least one of those meetings be held in Mountain Home because people were so surprised to see the $18 fee appear on their property taxes this year. Board chairman Mickey Pendergrass, also the county judge in Baxter County, asked the woman why she hadn’t gone to his office in Mountain Home to talk to him about the issue. Judge Pendergrass (Chair of Ozark Mountain Solid Waste District Board and a board member of NWA Economic Development District), stop trying to intimidate the residents! They need your clear, proactive communication and support as their PUBLIC SERVANT; they don’t need your condescending attitude. Board member and Marshall Mayor Kevin Elliott said he has been getting a lot of questions about the issue and he hasn’t been able to answer his constituents. He said he would like to know a little more about the fee collection. Board member and Berryville Mayor Tim McKinney patted a folder in front of him and told Elliott they could get together for a few hours and talk about it. But McKinney summed up the issue by saying the district spent far too much money buying something it didn’t need, then mismanaged it. He also said the bonds sold weren’t guaranteed by tax revenue, making them junk bonds, and there was plenty of blame to go around. “It’s a long sad story,” McKinney said. NOTE: The bondholder should have taken the loss, but instead, they had ADEQ and Judge Tim Fox force the property owner to cover the bondholder loss. In closing, be sure to support your local newspapers. 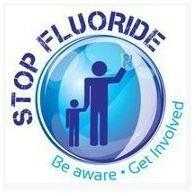 Much of the information in our articles comes from those, and they keep us informed of what’s going on in your area. Now… a sneak peak into a future article: Inland Waste Solutions — who are they?